Saturday was our community yard sale and, as I was walking Paco early Saturday morning, I noticed that the house that has the huge elderberry bush out front was going to participate. So, I decided that I should stop by to easily talk to the owners about seeing if they use their berries and, if not, if I could harvest them. We have an elderberry bush that I planted this year, but it's not yet producing berries. Saturday afternoon rolled around and I dragged the family out on the pretense that we were perusing the yard sale items, but all along I was plotting my elderberry takeover. My daughter was the first to figure it out, but they were fine with going down that street and, luckily, one of the owners was out front as we passed. To make a long story short, the owners do not, in fact, ever use the berries on their bush which must be at least 10 feet tall. They stated that their gardener would be stopping by shortly to trim it but that it was fine if I wanted to take the berries. I told them that I would drop off some elderberry syrup. So, Sunday, I set out with my kitchen shears and container in hand and harvested a bunch (which ended up being 2 cups of berries with stems et al removed). There are still a veritable crapton of unripe berries left on the tree. If all goes well, I'll be heading back there. My plan is to make elderberry syrup (I'll post about that later) as I spend a lot of money buying it for medicinal purposes (aka Sambucus nigra). It is a known antiviral and I started using it last year. I didn't get sick the entire time I was using it, even though my kids were constantly sick last year. Anyway, do you use elderberries? What do you like to do with them? And, do you bother picking off the dried flowers? Photo courtesy of Jonathan Billinger. Wow, talk about a blast from the past. We use to take old pillow cases with us and pick elderberries along the railroad tracks. We made pies (very seedy) and elderberry jelly by boiling the berries in water and then letting them slow drip out of the same pillow sacks into a big pot. Add sugar and pectin and you have jelly. Jealous! I need an elderberry source. 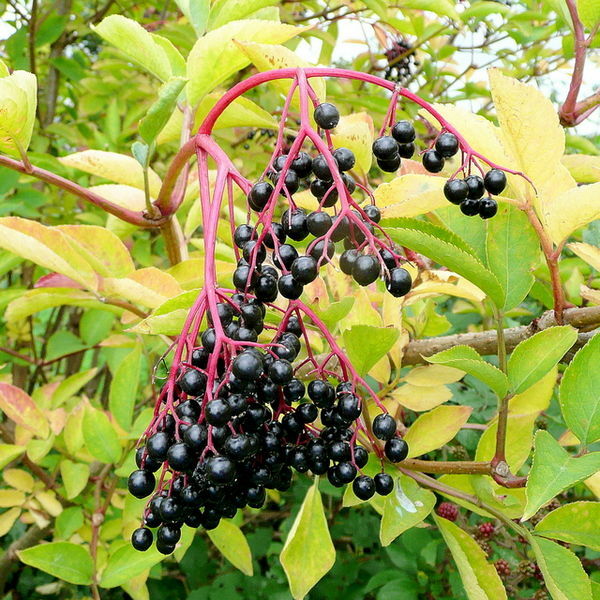 Many of my memories of my grandparents were tied to Elderberry wine and elderberry jelly. My grandpa was a winemaker and grandma the jelly maker. They hosted daily Wine Time at their place and let us have homemade wine coolers (elderberry wine/7-up was my fave). The jelly is still my favorite. The cloves are in it as a preservative, but we really enjoyed the flavour- very wintry/Christmassy. The children loved it to drink with hot water, so I'm going to have to make much more of it this year. I also have plans for Elderberry wine. We don't have elderberries around here, much to my dismay. I remember visiting friends in England though, who made elderFLOWER cordial. I suppose there are uses from the flower, then, as well as the berries. I put some elderberry juice in with pears to make a jam with *unbelievable* color last year. It tasted delicious too, sort of indefinably spicy. It's a lot of work, working with elderberries. I wouldn't bother with dried flowerheads clinging to the berries; I spend time and effort on removing as much stem as possible. This year I'm making a medicinal with elderberries and lemon verbena leaf in 100 proof vodka. I'll use it as part of my regimen at the earliest moment I suspect I'm coming down with something. Will definitely be adding some sugar to it though. Truth be told I haven't really been on top of my elderberry harvest this year. A lot of them have gone to the birds, and I only made a single large batch of elderflower cordial. I understand if you use a steam juicer you can leave stems on elderberries and currents when processing. With regard to E's comment - the stems are toxic and must be removed. I have made syrup and tincture (alcohol based) for medicine, as well as jelly for toast. I swear by it as an anti-viral, too. I want to try to make wine one of these days. Spiced elderberry sauce to eat with cold meat, sausages or on toast is my favourite use for elderberries. An elderly herbalist I knew said to always thank the tree for the elderberries. And that woodworkers never made cradles out of elder wood because it would poison the baby. Somewhere I read people put elderberries as a whole head (with the stalks) in the freezer and after being frozen they just could whip of the little berries. Could not try this out, freezer allready full to the top. Elderberry/blackberry jam is a favourit of past times, the spicyness of the elderberries pulling the little bit of blandness away from cooking the brambles. Fresh ginger and a clove or two liven up bramblejam too, though. Kate - What ratio do you use for the vodka mixture? Anonymous - I've heard the same thing about freezing them but haven't tried it. Ratio? No ratio at all so far. I just put cleaned elderberries and a verbena leaf in a clean jar and add just enough vodka to cover. Since it's intended as a medicinal, I just try to get as many berries into as little vodka as possible. Later on I'll add either sugar or simple syrup to taste. I have been progressively adding more elderberries (as they ripen) and topping them off with vodka though. I don't imagine that the steeping time is all that precise, so I'll just keep letting it go until I'm sure all the goodness has been extracted from the berries. Never done this before, so maybe I'm missing something obvious.